How do umpires currently call pitches at the bottom of the proposed shrinking strike zone? Statistics are more than plentiful, with a sample size of several thousand. Now that MLB's proposal to change the strike zone for the first time since 1996 is at the MLBPA's desk, it behooves us to form a little analytical projection: how will changing the zone affect umpire tendencies when it comes to the pitch at the knees? And how reliable is the strategy of using current trends to predict future results under a new regime of strike zone regulations? Visual representation of current strike zone. Short answer: Changing the definition of baseball's strike zone would disrupt and destroy a growing trend amongst umpires of calling the low strike (which is to say, calling a pitch located within the current strike zone a strike, or a QOC = Correct call). In other words, umpires are continually getting better and changing the rules might disrupt that trend. Longterm effects are unknown due to projected forecast bias, but one would surmise that the low strike at the knee tops, at least initially, would be called at a greater rate, than the current rate of knee-hollow strike calls. 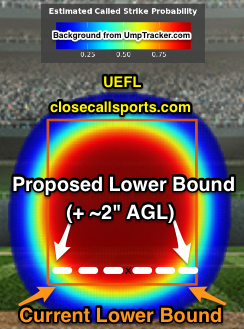 Alternately, one could surmise that the probability of incorrectly calling a low pitch, located below the knee top, a strike, would also increase. ESPN Stats & Info has run the numbers for pitchers, but only the UEFL has the analysis when it comes to the people actually tasked with making those calls. For instance, the percentage of taken pitches called a strike in the bottom two inches of the strike zone was about 24% in 2011, rising to nearly 50% in both 2015 and 2016; with such stats on called strikes, it's no wonder that MLB would conclude that raising the strike zone will help offensive production. 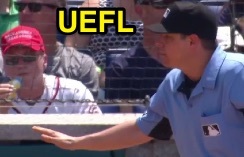 It's as if the umpires are properly and more consistently making the calls on the rulebook definition of the "low" strike, yet the players aren't adjusting (e.g., by swinging at them)...now that the rule is being enforced at a greater rate—now that umpires are getting better at their jobs—MLB wants to change its parameters. To recap, the proposal would raise the lower limit of the strike zone from the hollow to the top of the batter's knee as the batter is prepared to swing at the pitch, or, about a two-inch swing, on average. Using data from recent years, with the hollow-of-the-knee rule in effect, ESPN found that raising the zone by two inches (retroactively, of course) would have increased the league's aggregate batting average (as relates solely to the bottom two inches of the strike zone) from .238 to .270, slugging percentage from .348 to .415, and decreased the amount of called strikes by over three percent. Pitchers Jon Lester, Kyle Hendricks, and Wade Miley—who all heavily work the bottom of the zone—would have lost the most in regard to called strikes. We talked about it the other day in regards to the proposed extra-inning tie breaker mitigation strategy: raising the strike zone thus becomes yet another way to increase offense, scoring, and "action," due to batter's greater tendency to swing at pitches at the knee tops, as opposed to knee hollows. Otherwise, they'd just as easily take the low ball for more favorable counts and, potentially, walks. Complicating matters, added offense would probably do little to help baseball in its quest to reduce game times, but that's a separate discussion to be had. Umpire strike call tendencies at the low heart in-zone. Naturally, the aforementioned and following analysis, is conducted in a vacuum, without regard to real-world Pitch f/x error and other confounding strike zone analysis issues. It is presented as such. According to aggregate data over the years, raising the strike zone by two inches would affect Phil Cuzzi the most and Kerwin Danley the least: Cuzzi, at 92.0%, statistically holds the highest probability of calling the lowest strike (again, this is plotted on a pitch that is within the rulebook strike zone, meaning QOC = Correct), while Danley's statistical probability of 72.5% is the lowest. At the proposed lower bound, two inches higher than the current boundary, the stats are much the same: Danley still has the lowest probability (85.6%) and Cuzzi is fourth-highest (97.0%, behind Will Little [97.04%], Eric Cooper [97.1%], and Doug Eddings [97.5%]. These points are all taken at the heart of home plate (e.g., the center point of plate). Recall that the strike zone (as graphically indicated above) is realistically called in an elliptic manner, as opposed to a rectangular one: thus, we should expect that results on the lower bound corners (corresponding to a knee-high pitch over the inner or outer edge of home plate) would be different than that at the heart of the plate. And they are. Over the inner edge of home plate located closest to the right-handed batter's box (the left side of the screen on the Visual Representation graphic), at the current lower bound—the so-called true corner, where only a fraction of the baseball comes into contact with the planar edge of home plate—it is Ron Kulpa who holds the highest called strike probability (49.0%) and Jeff Nelson the lowest (19.9%). Over the corresponding left-handed coordinate, Vic Carapazza is the highest (22.0%) and Mark Carlson the lowest (2.6%). After raising the measurement site by a normalized two inches, it's still Kulpa (73.0%) and Nelson (42.8%) at the right box, and Carapazza (39.1%) and Carlson (8.6%) at the left. In other words, while the percentages and probabilities change, by and large, the umpire names do not, though different umpires would be affected in different ways at different horizontal points along the front edge of home plate. The trend shown on the Umpire Low-In Zone Strike Call Probability graphic is generally consistent, given a static horizontal coordinate at the heart of home plate. It is important to note that the vertical strike zone, which is at issue here, is variable from batter-to-batter, so the analysis must be conducted using a normalized strike zone (e.g., the standard BrooksBaseball strike zone, which is non-normalized [e.g., true to real dimensions] does not suffice); the zone used must stretch and consolidate pitches to match a constant strike zone that assumes each batter's lower and upper bounds are located at precisely the same graphical coordinates. Changing rules will change ump mindsets, too. Thus, when we discuss "two inches higher," we're speaking in terms of normalized averages: for the purpose of calculation, our normalized strike zone is exactly two-feet tall (1.50 to 3.50 normalized units), such that a two-inch reduction of the strike zone corresponds to a one-twelfth (8.3%) decrease in size. Thus, with a current lower bound of 1.50 units, we're looking at a proposed lower bound of 1.67 units. A new thought will be, "how low is too low?" ...Which is subject to forecast bias if the strike zone downsize plan actually comes to pass, as quite presumably, umpires will not call top-of-knee pitches the same under the "new rules" as they do, presently, under the current rules. Succinctly, at present, a pitch at the top of the knee is more easily called a strike, since it is fully and unequivocally within the strike zone by two vertical inches. 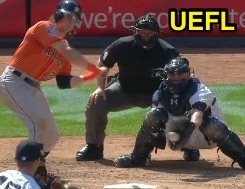 If the rule were to change, however, this same pitch would be "borderline," meaning that umpires would treat it quite differently than the "sure-thing" such a pitch represents under the current ruleset. Therefore, because umpires will have to contend with a new lower boundary at this new knee-top location (and the corresponding psychological hurdle that comes with it), strike call probabilities at the knee tops, all else equal, will drop. This is the crux of why using present-day knee-top numbers to project future results is unreliable to some unknown degree. The question is, "by how much will that percentage decrease?" and this is the unknown answer that will inject forecast bias into any calculation in regards to the "two inches higher" argument. Accordingly, while using "two inches higher" to compare hollow-of and knee-top calls in the present-day may induce provocative statistical differences, due to the anticipated forecast bias that will result from changing the lower K-Zone boundary—and by extension, the umpire's entire psychological and philosophical construct of "how low should I go? "—using present-day data to project called strike probability in the future knee-top era is, ultimately, susceptible to an unknown degree of error and unpredictability, as we have no triangulated camera measurement data to cite or compare from 1995, when the rulebook last placed the lower limit of the strike zone at the kneetops.